You know how when you wear that one color, everyone says that looks so good on you…that is definitely your color? That’s me when I wear coral. My husband likes it on me. My friends like it on me. And well, I like it on me. 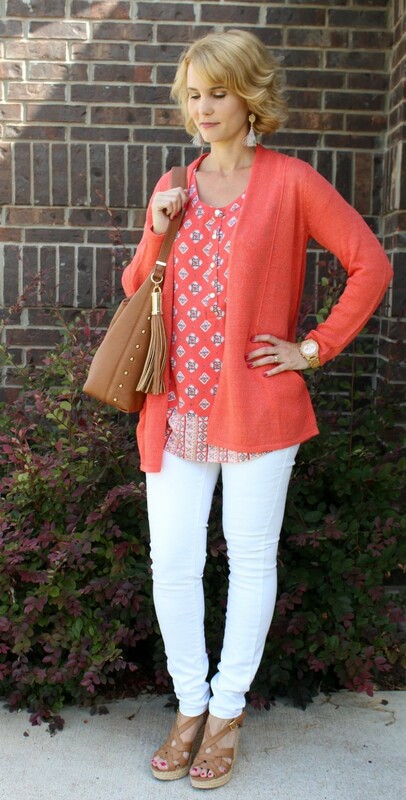 I have a white jeans outfit to share with you today that features one of my favorite brands and one of my favorite colors. I’m wearing the J. Jill draped pocket cardigan and their medallion mixed-print sleeveless top, both in papaya (or coral). 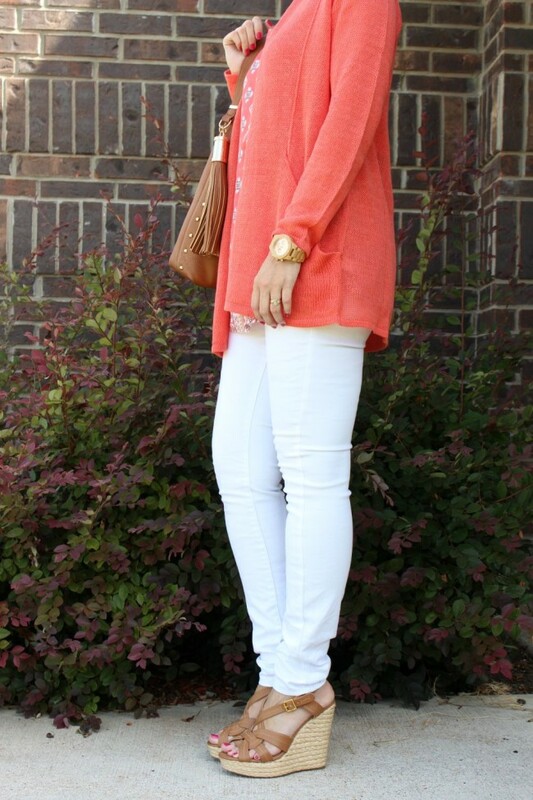 This color paired with white denim and my brown sandals has become a favorite outfit of mine this summer. The great thing about the cardigan and top is they can easily transition into fall, just like my J. Jill chambray shirtdress. When I do add items to my wardrobe in late summer, I like to add items that can carry over to fall. For fall, I would wear this with dark or black denim and a pair of booties. Here’s what the top looks like without the cardigan. As you can see from the photos, the sleeveless top has an attached border that gives it a layered effect. It’s 100% rayon woven, which feels amazing on and it has washed really well. You do have to line dry it and give it a little love from the iron afterwards. The cardigan is very lightweight and has an interesting pocket design. I can’t wait to pair this cardigan with other tops. It’s 59% linen, 33% cotton and 8% modal rayon yarn and requires hand washing, but shouldn’t need to be washed that often. That’s three pieces I’ve shared with you from J. Jill’s July 2015 line: draped pocket cardigan, medallion mixed-print sleeveless top and chambray shirtdress. Stay tuned for some gorgeous items from their August line! Disclosure: Mom Fabulous received samples to facilitate this post. This post also contains affiliate links, which when you click on them and make a purchase, Mom Fabulous makes a commission. 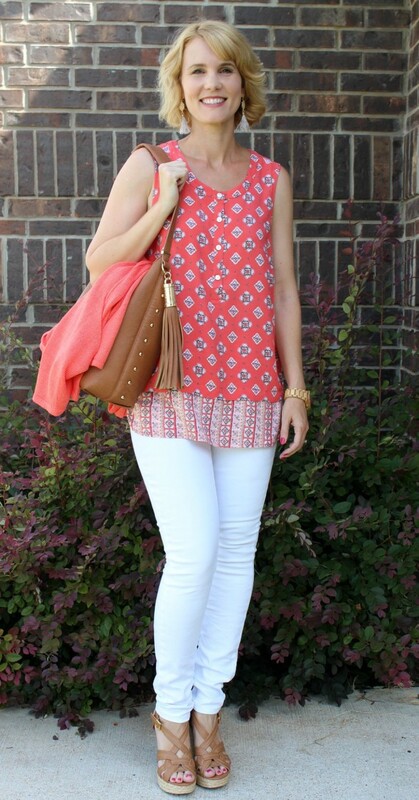 Yes, I absolutely agree that coral is your color. GORGEOUS!! 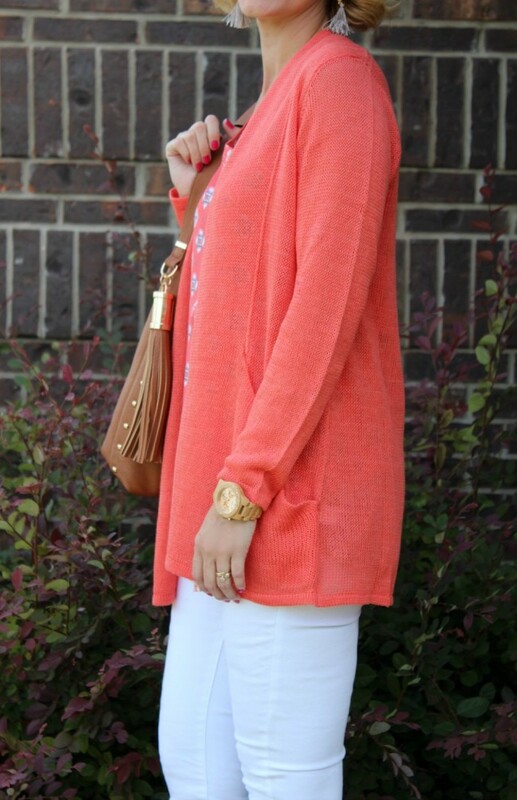 Adore that cardigan and coral and white is one of my fav color combinations! 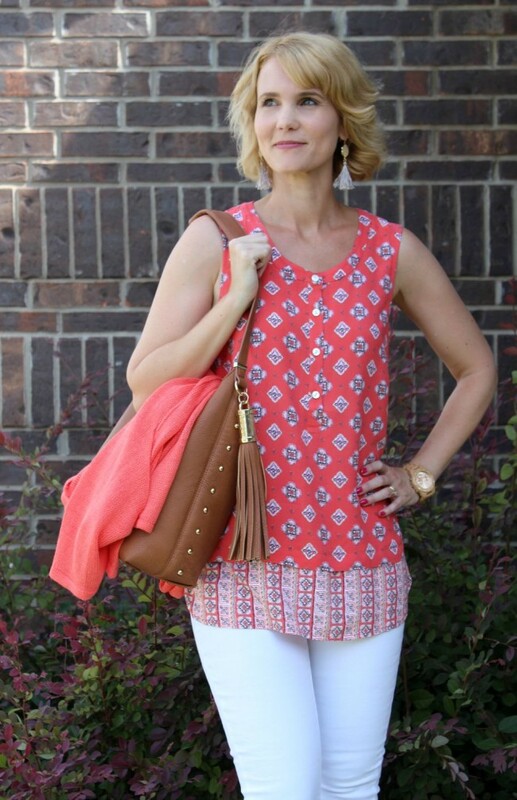 I love coral too, both of those tops are fabulous and the white really makes them pop! Great outfit! Beautiful outfit! 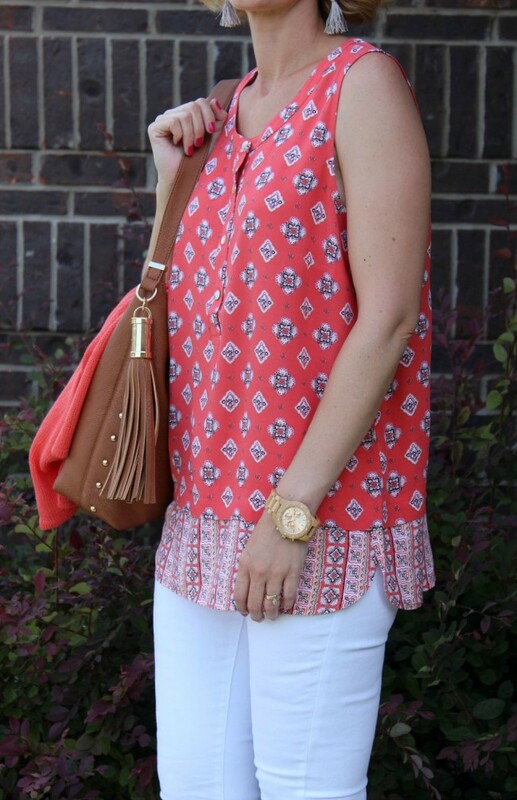 Coral and white is one of my favorite summer color combinations.